B&Q has issued Hope&Glory with a newly created brief with the aim of increasing the retailer's brand awareness. The appointment was made without a pitch following a successful test project that saw the agency launch the 'Garden Party' campaign to tie in with the 2015 general election. 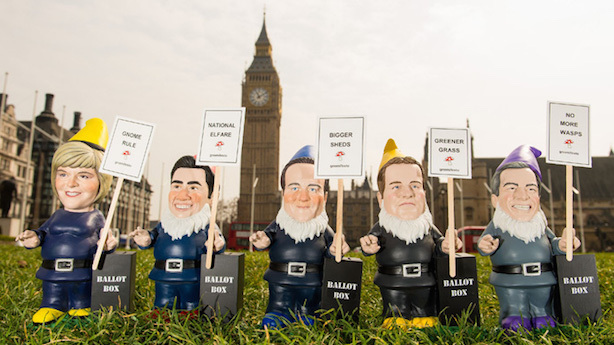 The tongue-in-cheek idea led to the creation of seven dancing gnomes, each resembling one of the main political leaders. The aim was to promote B&Q and help gardeners decide which party to vote for. The agency secured coverage across national media including the Daily Mail and The Sun, as well as BBC’s Daily Politics and Channel 5’s The Wright Stuff. The Garden Party project was an example of 'news-jacking', which is another core part of the brief. Hope&Glory will be looking to come up with more campaigns that piggyback popular culture and news events. Jane Sell, PR manager at B&Q, said: "We felt there was an opportunity to bring in a partner that can help us remain relevant to the agenda and get people talking about our campaigns, and are looking forward to working with Hope&Glory to achieve that."